Members of the local media fraternity have been urged to keep gory details and photographs of accidents and similar scenes off the front pages and away from featured images. The nudge came at a workshop organised by the Guyana Press Association (GPA) and the Pan American Health Organisation (PAHO) on Friday. 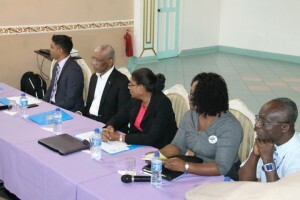 The workshop was organized specifically to increase the awareness of health and other development issues influencing the adoption of healthy lifestyles in Guyana. GPA President Neil Marks in his remarks stated that it is important that media reports on suicide and related issues are done in a manner that provides the information to the public in a healthy manner. He pointed out that often times, media professions are blamed for being sensationalists while reporting on Guyana’s suicide epidemic. Telecommunications and Tourism Minister Cathy Hughes made the plea for journalists to consider the ramifications of reporting the grisly details of suicides and other issues in the press. She said that the greater the coverage of a suicide story the greater the possibility of a suicide copycat. “Please keep the pictures of smashed up cars, dead bodies lying on the roadway, and the minute by minute details of the last days of a suicide victim off the front pages,” Hughes stated. The Minister indicated that research has shown that when these issues are given less prominence in the media, the likelihood of it being repeated lessens.